Structures for solar panels There are no products in this category. What are the structures for solar panels? Structures for solar panels are composed of 2 horizontal aluminum profiles and fasteners such as brackets, screws and stainless steel staples, materials suitable for outdoor use. Thanks to these materials, the structure is light and easy to install and has a lifespan of over 25 years. This structure complies with current legislation and is certified TÜV European manufacturing. Its design is performed by the number of modules can reach any size, it will depend on the amount of solar panels to be installed and power installation. Because of the simplicity and versatility of the structure, it is possible to adjust mountings and designs of their own facility, however complicated as these. • On sloping roofs, as roof: the modules are placed in parallel to the deck, and the structure that supports anchored by salvatejas or the like. 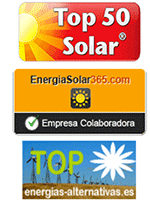 The structures are available and prepared for the type of installation and the specific photovoltaic module. What are the structures for flat roofs? What are the structures for sloped roofs? It is horizontal profiles which are fixed in parallel to the cover by salvatejas or similar.